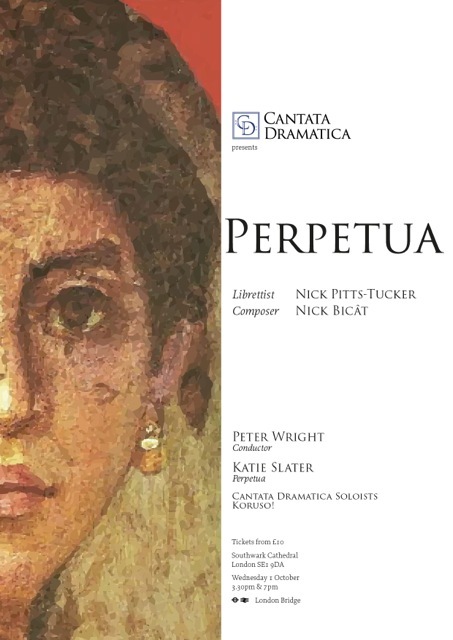 Perpetua, with music by Nick Bicât and libretto by Nick Pitts-Tucker was Cantata Dramatica's first commission. It tells the moving story of a young widow and mother living in Carthage (now Tunisia) in 203 AD; an exceptional witness to a spirit of independence who found herself standing up for personal beliefs and freedom against the might of the Roman Empire. The production draws on contemporary sources, including Perpetua's own diary - an astonishing survival from the ancient world, which brings her personal journey to life with startling immediacy. Perpetua, with music by Nick Bicât and libretto by Nick Pitts-Tucker was Cantata Dramatica's first commission. It tells the moving story of Perpetua, a young widow and mother living in Carthage (now Tunisia) in 203 AD; an exceptional witness to a spirit of independence who found herself standing up for personal beliefs and freedom against the might of the Roman Empire. It explains how she came to take this terrifying path and how she met the challenges before her. The production draws on contemporary sources, including Perpetua's own diary - an astonishing survival from the ancient world, which brings her personal journey to life with startling immediacy. Dramatised by Nick Pitts-Tucker, in a mix of original Greek and Latin together with modern English, the story is set to music composed by Nick Bicât, whose imaginative response to the text ranges from lyrical and transcendant to dramatic and confrontational. The London première of Perpetua took place at Southwark Cathedral, London SE1 on 1 October 2014.